The trawler George Lauren went aground outside the harbour at Whitehaven, England. The trawler had broken its mooring lines as heavy rain and gale force winds battered the area. The vessel was quickly pinned against the breakwall and winds reached 65 mph and swells of 10 feet. 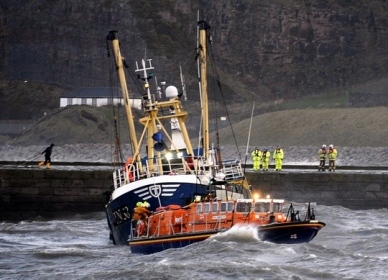 A joint rescue was conducted by the Coast Guard from Whitehaven with the RNLI lifeboat from Workington were able to pull the trawler free. The only man on board the George Lauren suffered minor injuries. No reports of pollution being released.